It’s fitting that Esquivel’s name was usually printed with an exclamation point: his trademark is the musical exclamation point, whether it’s a “Pow!” sung by the chorus or a “zing” from a harpsichord. Esquivel’s orchestrations were like an exploding musical piñata with arrangements that were strikingly futuristic. Scattered among the pianos and trombones were slide guitar, echo, dissonance, beatnik percussion and weird juxtapositions of mood and volume. His “kitchen sink” approach incorporated Chinese bells, organ, jew’s harp, gourds, and timbales. He is most well known for his musical triumph, ‘Infinity in Sound Vol 2‘. Juan recorded for RCA Victor from 1957 to 1968. His arrangements took full advantage of the stereo phenomenon happening at that time. Being a musical visionary as well as a talented technician he composed music specifically for the two-channel stereo future. In doing so he drove his recording engineers, top studio musicians, and RCA executives a little crazy. He was a perfectionist with passion, a sonic inventor, a dashing genius. 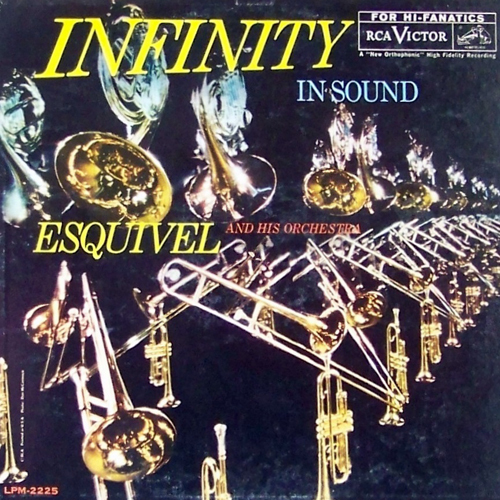 Juan kicked off the Sixties with Infinity in Sound (l960) and one of his finest achievements, Infinity in Sound Vol. 2 (l96l). The songs “Jalousie” and “Sentimental Journey” were used in a famous video sketch, in which pioneering TV visionary Ernie Kovacs synchronized the music to remote-controlled office furniture and secretarial equipment. Latinesque (l962), in the opinion of many, was his wildest and most ambitious effort. This tour-de-force featured “raindrop” pianos, Maruichi trumpets, “steel guitar zings,” and cross channel echoes, along with an array of French Horns, tympani, flutes, and tuned bongos. In 1963 Juan switched from studio work to live performance, creating a stage show featuring singers, flashing lights, and choreography. In addition to his orchestral recordings for RCA, Juan composed and recorded short mood pieces for Universal Studios. These themes were used in hundreds of TV soundtracks, including Bionic Woman, Emergency, Harlem Globetrotters on Gilligan’s Island, Incredible Hulk, and Magnum, P.I. In addition, Juan arranged and orchestrated the music for the burial scene in the film 20,000 Leagues Under the Sea. In 1979 Juan Garcia Esquivel returned to Mexico and composed for a children’s series called ‘Burbujas’. An album of songs and instrumentals from the series went Platinum, selling over a million copies. After Burbujas, Juan settled down in Mexico City, preferring privacy to celebrity. Esquivel’s world renown earned through his RCA albums coincided with a period when rock groups eclipsed orchestras as the popular standard-bearers of pop music. Consequently, Esquivel was the last great big band leader. He certainly deserves credit as the visionary whose musical rocket fuel propelled the pop orchestra into the 21st century.